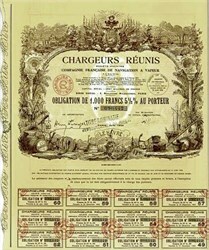 Beautifully engraved certificate from the Chargeurs Reunis (United Shippers) issued ion 1939. This historic document has an ornate border around it with vignettes of old sailing vessels, castles and shipping scenes. This item has the signatures of the Company’s President and Secretary. There are 36 coupons attached - not all shown in the scan. This item is hand signed and is over 68 years old. Chargeurs Reunis was formed in 1872 to operate a service between Havre and Brazil and the River Plate. In 1883, the company acquired the Societe Postale de l'Atlantique which ran a service to Canada and in 1889 commenced a new service to the west coast of Africa. The Compagnie Commerciale des Transports a Vapeur Francais was taken over in 1894 and Chargeurs Reunis thus acquired their services to New Orleans and the Gulf of Mexico. A new route to South Africa and Madagascar opened in 1896 and lasted until 1905, and a service from Dunkirk to Saigon and Haiphong started in 1901. During 1905 a 'round the world' route was opened from European ports to China and Japan, across the Pacific to Hawaii and the West coast of the USA, Mexico, Punta Arenas, Montevideo and Europe, but ceased in 1911. In May 1928, an agreement was reached with the Polish Government for the opening of an emigrant service from Gdynia to Brazil and Argentina and this continued until 1931. In 1929 the company entered the fruit trade and built a fleet of special ships to carry bananas from Africa to France. During the second world war, the company sustained heavy losses and received several ex-German ships and Liberty ships as compensation and in 1946 a cargo service commenced between Dakar and the United States. Services continued after the war, but the increase in air travel and the loss of French Indo-China gradually forced the company to abandon passenger services.